One type of food I love eating in the winter is soup. It warms me up on the days when the high is ZERO degrees and helps me get more vegetables in my diet. This black bean soup is full of veggies and of course black beans making it a high fiber and protein meal that is naturally low in fat. Perfect for your New Years diet! The flavor is similar to that of chili and taco soup but it’s meatless so it’s less $$$ and is perfect for the vegetarians in your life. And what would a soup be without all the amazing topping?! The cool and creamy sour cream help cut the heat and brings a little comfort. I highly recommend full fat sour cream for everything. If you’re on a strick diet then just use less. I don’t know, my opinion is that it’s better to eat smaller portions of the best tasting stuff than lots of subpar low-fat versions. K, back to the toppings– then you need to throw on some cilantro– my favorite herb that I just can’t live without it. And another thing I can’t live without is some crunchy texture so bring on the chips! Looking for more fantastic soup recipes? Try my Chicken Lime Soup and Tomato Basil Soup. Sort through beans, rinse, and then soak overnight. Drain and rinse. Place all ingredients in a large pot and bring to a boil. Cover, reduce heat to low, and simmer for 2-3 hours until beans are tender and soup has thickened to your liking. Want more delicious recipes like this one right to your inbox? How about exclusive cooking tips and subscriber only giveaways? Sign up for my once weekly newsletter right here. I made the black bean soup & it was delish! I love soup & can eat it all year round. I can’t wait to try some more of your recipes. I pinned this to try….can’t wait to make it! Looks delicious! Shared in my round up for this week’s Dream Create Inspire. Thanks for linking up with us! These look delicious! Thanks for linking up to Link Party Palooza!!! I am glad to have found your blog- it looks super delicious! Have a great weekend! This looks delicious! I have to make this one day. Thanks for sharing at Tasty Tuesdays! 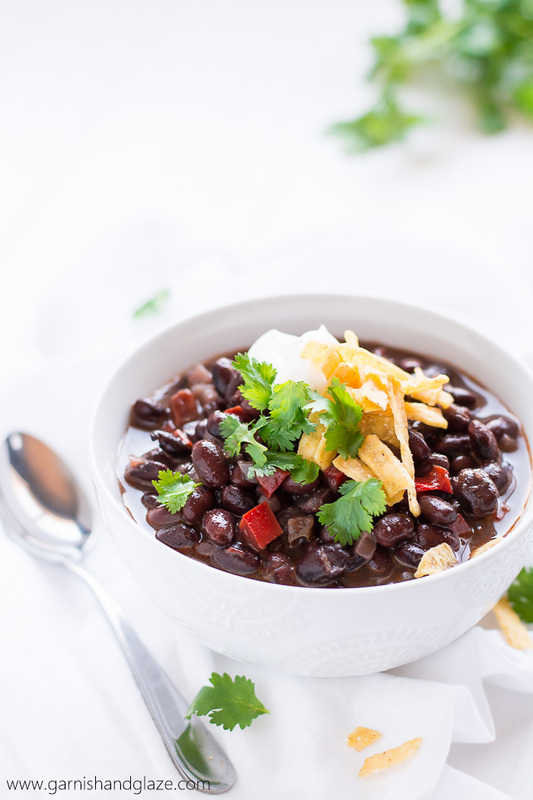 I love black bean soup, and this looks so easy to make!